Success, triumph, enthusiasm, leadership, recognition, strength, power. Majestic Elk carries himself with honor. Alert and noble, he walks with you on your chosen path, guiding you in making the best use of your energy to avoid burning out. Pace yourself, and concentrate on what needs to be done. Be confident in your abilities to make your dreams a reality. You hold the power to change your destiny and reroute it to your desired outcome. Trust in your intuition; if something doesn’t feel right, listen. Expand your awareness of the light and beauty you hold within. Realize that your optimism and persistence will drive you to attain what you set out to accomplish. Belief in yourself will inspire others to follow you. 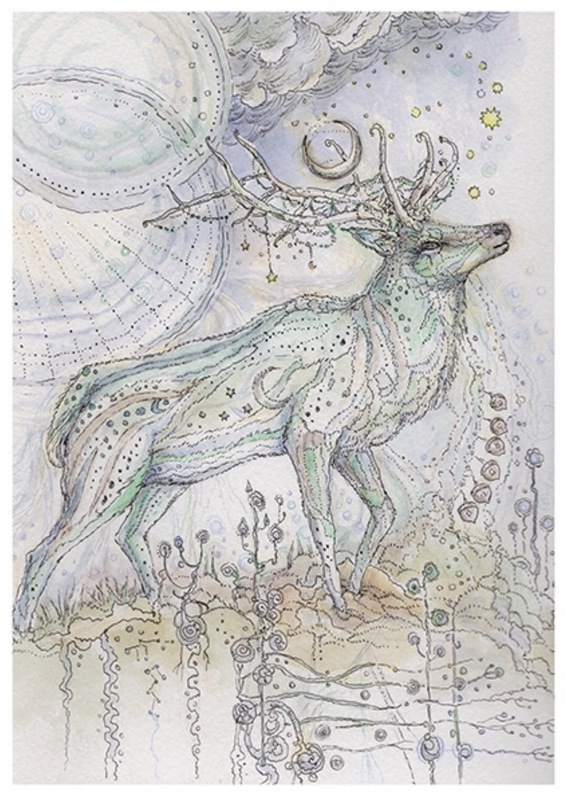 This entry was posted in Artist, Deck Review, Featured Card of the Day, General Tarot, Readings and tagged 6 of Acorns, Elk, Paulina Cassidy, Spiritsong, Tarot.